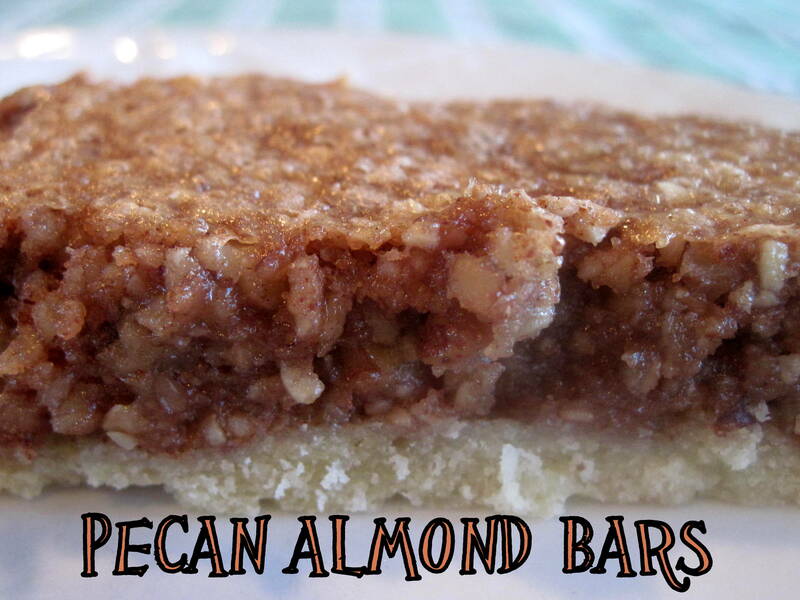 One of the most popular cookie bars from the Joy of Cooking cookbook is the Pecan Bars recipe. I thought I would switch it up a bit and add almonds, I know, I am wild, you didn’t think you would ever see this side of me did ya??? Welcome to my world! I thought these would be a perfect dessert for Thanksgiving because you can cut them into bars or slices, great finger desserts. It has a nice sweet buttery crust with a cinnamon nut filling. For Crust: Cream butter and sugar until well blended, beat in egg and vanilla. Combine flour and salt. Add in 3 parts to butter mixture, blending well. Use your hands to pat the dough evenly in a greased 9x 12 inch pan. Bake about 15 minutes. For filling: In a heavy saucepan, beat egg whites over low heat until frothy. Sir in nuts, sugar and cinnamon. After sugar has dissolved, increase heat slightly. Stir and cook until mixture leaves the side of the pan, but remove from heat before it is dry. Spread it over pastry base. Bake about 15 minutes longer. When cool, cut into bars or sticks. Hi, I am very interested in your Pecan Almond Bars, but the recipe that is listed, does not say what temperature to bake them on. Could you please reply? Thanks so much! Thank you for pointing that out to me, I have corrected it, Bake at 350 degrees F.